Musanze, Rwanda – A horrified Rwandan woman suffered the shameful indignity of sitting next to a pair of mzungu on the bus to the Ugandan border Thursday. An unnamed source described the woman as “crestfallen” when she arrived at the matatu park and realized the only remaining seat would result not only in close proximity but possibly even have her touch the sweaty foreigners. The humiliated woman spent the trip suffering silently amid the pungent odours of entitlement and ketchup, quietly ruing her foolish decision to try squeezing out a bit of last minute pee before leaving home. Cyanika, Rwanda – A Canadian man had his testicles stored away for safekeeping at the Rwandan – Ugandan border last week. As he was outside filling in his visa form his wife was busy inside shaming him by paying for both visa fees, making no attempt to hide the fact she was carrying the bulk of their money. Baffled customs officers took some time to regroup but eventually were able to complete the immigration process making only periodic jibes at the disgraced man’s expense. Kisoro, Uganda – A great step forward in scientific DNA cloning was confirmed in Southwestern Uganda this week when the Kisoro Hobgoblins won the District Women’s Field Hockey championship. The controversial unit is believed to be the first ever team to be comprised entirely of one identical strain of DNA. The genetic code, tentatively named Butch Dyke, finally reached the manufacturing stage after years of testing on fuzzy puppies has been used to successfully create a full roster of stocky, bluff-faced women with short hair, shapeless tunics and the wily ability of a fire hydrant to remain solid over the ball. 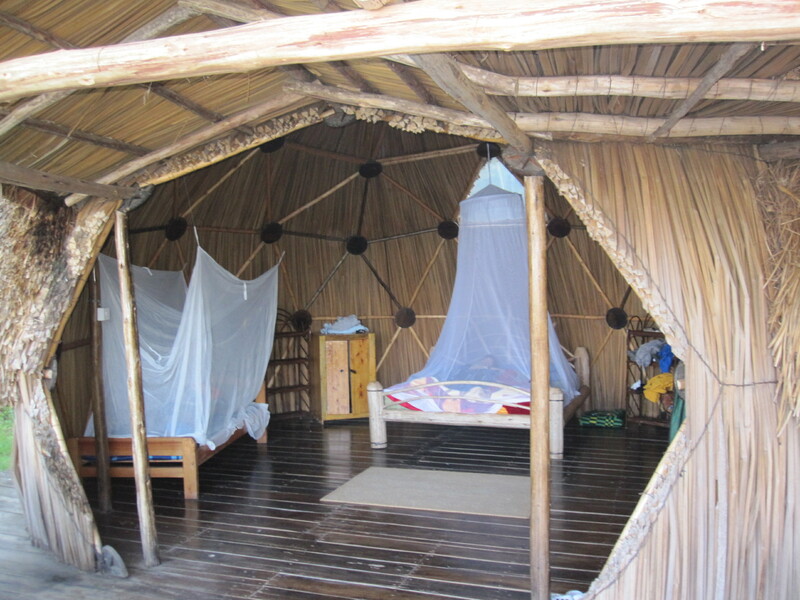 Lake Bunyoni, Uganda – A visiting Canadian woman was startled out of her early morning reverie yesterday by the sudden appearance of a small green tree frog high in the upper reaches of her mosquito net. Her crafty partner managed to head off any potential attack by daintily corralling the diminutive would-be assassin and struggling with it in a rather feminine manner before finally setting it free in the wilds just off the side of the veranda. Police are still investigating the frog’s motivation. 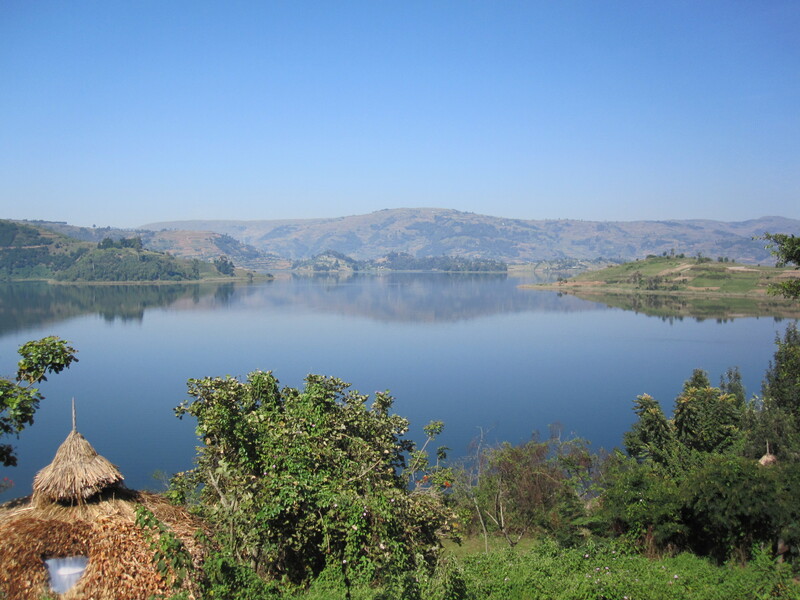 Lake Bunyoni, Uganda – A Canadian man narrowly avoiding emergency treatment over the weekend when he overdosed on tranquility and relaxation. After apparently spending nearly 72 hours engaging in nothing more taxing than pressing the buttons on his digital reader, gazing out over the placid lake and occasionally scratching his groin, his brain ultimately slipped into a type of vegetative state, making even the most routinely idiotic comments impossible to form. Wife Laynni Locke described him as “zombie-like”, “really hard to talk to” and “somewhat of a nice change”. However, after the seventh time she found him gaping out at the lake taking pictures and softly drooling she finally reclaimed the camera and sent him for a walk around the island. He returned “feeling a little less loopy”, although somewhat sweatier and still picking aimlessly at his groin. Masaka, Uganda – When Zain, one of 5 major telecommunications suppliers in Uganda, put the last bright pink touches on a small tire repair shop /mobile air time provider in the small transit town of Masaka Tuesday it marked the dramatic conclusion of Ugandan Home Makeover. The completion of this tremendously ambitious project, commenced back in 2006, means that finally every single building in the country is both festively painted in bright cell phone-y colours and an “Authorized Mobile Dealer”, putting to rest once and for all any danger of individuality or personal expression through the unauthorized use of latex-based paint. Kampala, Uganda – East African fans of rugged bus travel joined together in anticipation this week as a local morning bus from Kabale to Kampala came tantalizingly close to achieving something most consider to be impossible – the Never-Ending Ride. Nonetheless, Horizon Bus Lines #17 displayed and impressive repertoire of stalling techniques in extending the normally seven hour jaunt into a nearly twelve hour battle of contrition. By employing a myriad of clever stoppages for things such as gas, snacks, potholes, hitchhikers, cigarettes, anonymous passersby, boisterous friendly greetings, accidents, goats, darkness, a twitchy brake foot, alleged strange noises and one startling mystery fart, the rickety old Pullman came enticingly close to carving out a place in African bus history. Millions of excited Ugandans groaned in disappointment when the journey finally ended amid the soggy, hectic darkness of a Kampalan rush hour. 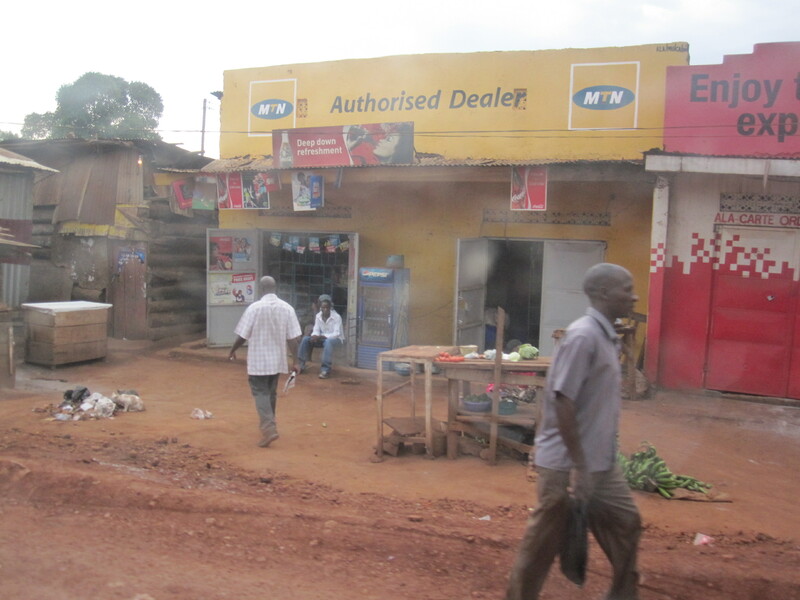 Kampala, Uganda – Authorities acted quickly yesterday to defuse a potentially embarrassing situation in downtown Kampala. 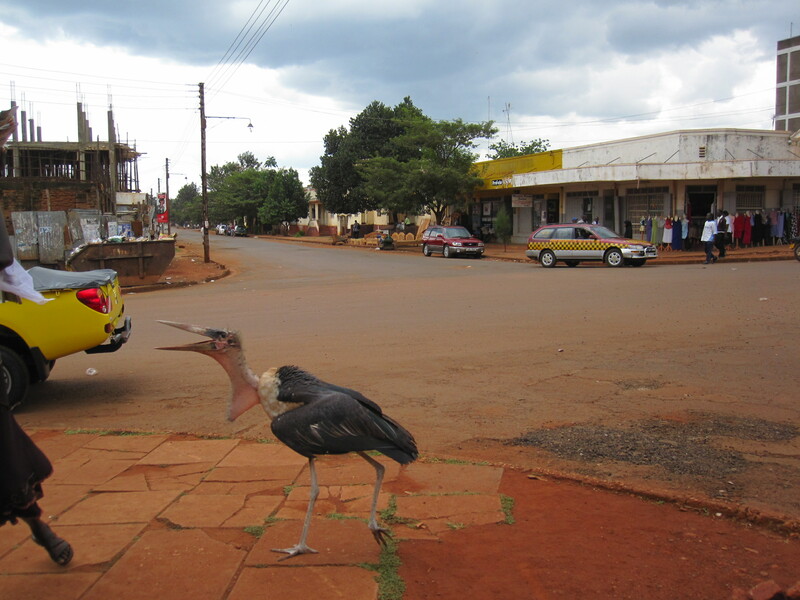 A tourist struggling down the congested sidewalk mistook a large Marabou Stork rummaging through a pile of roadside debris to be just another of the many slim, awkwardly built beggars that roam the city. He then frowned distractedly and shook his head in a clever attempt to discourage it from looking to him for financial assistance. The giant knobby-kneed scavenger, not surprisingly, took offence, quickly pointing out that it does a perfectly fine job fending for itself, needing nobody’s help to fulfill its primary purposes in life – using its filthy oversized beak to move dung around, freaking out children and motorists by swooping its 6 foot long misshapen body low over busy streets and shaking its disgustingly raw pink waddle to and fro. Sleeping Baby Cosmetics – apparently bald, fat and suffering from diaper rash is en vogue oorrr… you want to look your best when the baby’s asleep and opportunity knocks?? You have to love it when even a politician knows where to draw the line.